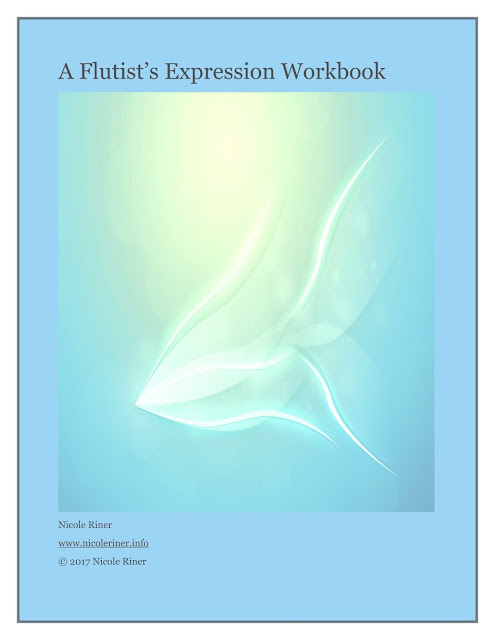 Nicole Riner, flutist: Announcing my Flutist's Expression Workbook! Announcing my Flutist's Expression Workbook! ...just in time to combat the back-to-school obsession over All-State auditions and marching band shows! This book has been a two-year labor of love and I will continue to update and improve it with your feedback. I've just released A Flutist’s Expression Workbook, appropriate for junior high through adult students. The Workbook utilizes exercises from 19th Century vocal method books as a vehicle for developing beautiful, flexible tone and more creative expression in playing. Vocalises are presented with two sets of expression markings followed by text meant to lead the student through the musical effect of the markings as well as specific instruction on how to perform those markings effectively. There is also an unadorned copy of each vocalise for students to mark for themselves as they explore their own musical creativity. Supplementary material includes four duets, arranged from their original operatic settings, for flutes and piano, and piano accompaniment to all vocalises. It's available in print edition (spiral-bound) or digital download, which also includes .mp3 files of select accompaniments to play along with and extra "blanks" of each vocalise for your musical marking pleasure! You can read more about it, view sample pages, and order at this link. I'll be updating that page with supplementary videos of me teaching some of the vocalises throughout the fall. Please feel free to share this information with colleagues and students, and thanks for helping spreading the word! Altus Artist, Visiting Assistant Professor of Flute at University of Wyoming, international recitalist. 2016. Simple theme. Theme images by gaffera. Powered by Blogger.